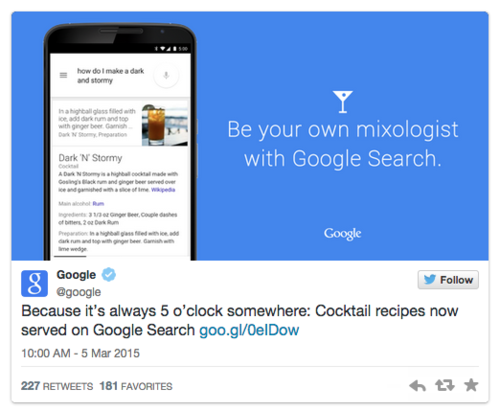 Google announced a new addition to its Knowledge Graph this morning, adding cards that walk through the recipes for various cocktails. The cards break down the “main alcohol” for each cocktail alongside standard garnishes and recommended glassware. Recipes for food (“how to make meatloaf”) have been part of the Knowledge Graph for some time, but engineers noticed a lot of requests for cocktails specifically, and Search data gave them a clear ranking of which cocktails users were most curious about. For 2015, the Moscow Mule topped the list of most-searched cocktails, followed by the Margarita and the Bloody Mary.